Podcast #211 – Goodbye Summer! The hot weather may finally be gone for this year. We had two nights of freezing weather this week, which is our traditional indication that the summer growing season has ended. The bells are in the round 1/2 bushel basket, the jalapenos (and a lonely eggplant) are to the right, the Anaheims are to the left, and the cayennes are in front. Pepper jelly, here we come! Our heat-loving veg had managed to muscle through the first light frost three weeks ago with the help of frost blanket and a little luck, but this one seemed likely to take them down, so Amanda pulled her copious pepper harvest. 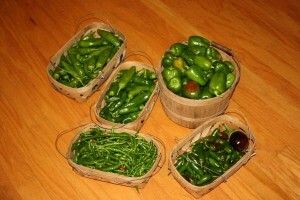 Easily our best haul of peppers yet, the bounty includes a half bushel of bell peppers, a generous haul of Anaheim peppers (the mildest of the hot peppers), and more cayennes and jalapenos than we’ll ever be able to use. Today’s podcast summarizes our wrapping up the warm season and battening down for the cold season ahead. We also review our closing down the orchard for the winter. I promised you I’d do my best to find out when we began harvesting muscadines. I noted our first harvest on September 2, so that means we were picking muscadines for 10 weeks this year. Yeah!